With Austin’s fast growing population, more people are accessing our beautiful Lady Bird Lake everyday. Canoes, kayaks, paddle boards, rowers and commercial river cruises are filling our downtown waterway. Learn the 12 ‘River Sensibles’ that will help keep you safe while enjoying the river. Then take our fun River Sense Quiz. You’ll receive special offers from Lady Bird Lake vendors who will provide you with discounts for canoe, kayak, paddle board, rowing rentals and more. Texas River School provides river safety and canoeing education for Austin’s underserved youth population as well as for students from the 4th through 12th grades and adults of all ages. 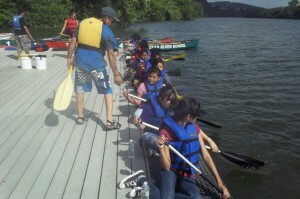 Our 1/2 day class includes a simple online River Sense quiz and a paddle trip on Lady Bird Lake. We suit up our students with personal flotation devices (life-jackets) and get them on the water in Texas River School canoes. We teach canoe skills – a lesson on the different parts of the canoe and how to maneuver a canoe on the water. The day ends with a wrap-up lesson on what the take-out entails, how to pack and haul equipment, and how to work as a team.